Our Personal Effectiveness Series is designed to help enhance your overall ability to perform various tasks and activities in your daily life. Our goal is to help you learn the practical, straightforward skills and strategies needed to excel in all areas of your life. This series focuses on those skills that can be easily integrated into a your daily life, so much so that it improves your overall effectiveness in getting various types tasks and activities completed efficiently and successfully. In contrast to our Interpersonal Skill Builder Series which focuses on relationships and interactions with others, this series centers on skills that can be applied independent of other people. 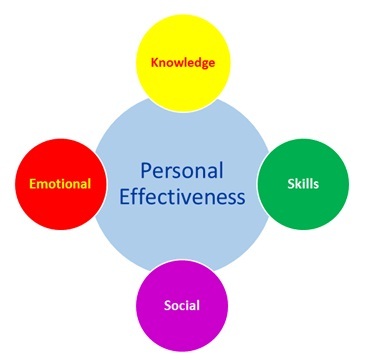 These personal effectiveness skills include personal goal setting, time management, problem solving, and emotional intelligence. With our Personal Effectiveness Series, we focus on specific skills and competencies that will improve your ability to reach your personal goals. We provide information to assist you in building personal skills such as time management, organization, problem solving, and decision making. Developments of these skills allow you to become more capable, competent, and confident and ultimately help you reach your goals. We also provide information and strategies to help you to make the most of your talents and abilities. These strategies include developing positive habits, goals setting, emotional intelligence, and stress management. We integrate ideas on how to effectively and efficiently utilize these competences in a learning and educational environment as well as daily life. These techniques and strategies can help you become exceptionally effective as you strive to build your skills.